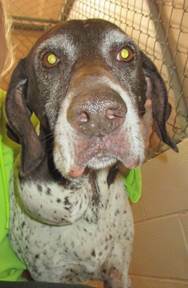 Good old Britches ended up in the shelter when his family surrendered him. We rescued him and gave him a bit of a tune up in foster care. Fortunately for Britches, a member of his former family who didn’t know he’d been taken to the shelter came forward and wanted to take care of Britches for the rest of his life. Enjoy the rest of your time Britches, someone you know loves you very much. Thank you to Ron and Dr. Jyl for fostering Britches and helping him get healthy!